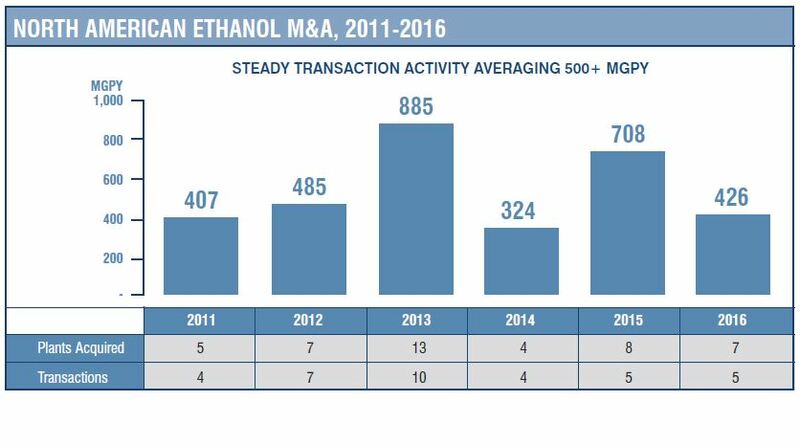 For the second straight year, the North American biofuels industry experienced year-over-year growth in M&A transactions. In 2016, there were 12 M&A transactions, the most in 5 years. In total, the 12 transactions were worth an estimated $450-$500 million and involved 14 plants with nearly 700MGPY of production capacity. A higher than normal proportion deals were in biodiesel, 7 of 12. 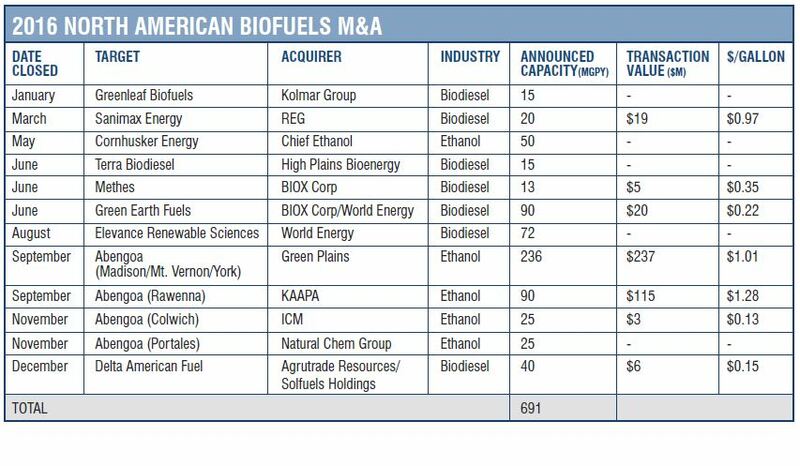 In addition, in advanced biofuels, there were 5 acquisitions, from 4 in 2015. While valuations were modest, M&A transactions in 2016 were driven largely by bankruptcy and biofuels plants being retrofitted for other purposes. Buyers were driven to opportunistically add scale as sellers had to close deals. The break-up and sale of Abengoa’s portfolio of North American renewable fuels assets were the impetus for over 50% of the 2016 M&A transactions in terms of volume, capacity and transaction value. Abengoa, the Spanish renewables company, sold 6 ethanol plants and a cellulosic ethanol plant in Hugoton, Kansas. On the buyside, Green Plains was active once again by acquiring three of Abengoa’s plants. The acquisition of the three plants makes Green Plains the 3rd largest ethanol producer in the US. In biodiesel, REG bought Sanimax Energy, their 11th biodiesel plant. Chief Ethanol acquired Cornhusker Energy – the diversified Chief Industries added a second ethanol plant in Nebraska. Green Plains acquired 3 Abengoa plants in a bankruptcy process – Green Plains added 3 plants located in Illinois, Indiana and Nebraska with cumulative capacity of 236MGPY of capacity. KAAPA acquired Abengoa’s Ravenna, NE plant in a bankruptcy process – KAAPA picked up its second, wholly-owned plant. ICM acquired Abengoa’s Colwich, KS plant in a bankruptcy process – ICM picked up this smaller-scale (25MGPY) plant. Natural Chem Group acquired Abengoa’s Portales, NM asset – this non-operating plant is likely destined to be re-purposed as a transload and distribution terminal. Two themes drove the market – (1) distress, which in the case of the Abengoa assets was caused more by corporate financial pressures than the microeconomics of the US ethanol market; and (2) consolidation, since all of the acquirers of the operating plants already owned plants. Ethanol plant buyers remain a small club. Since 2009, 5 buyers have accounted for 78% of the capacity that has traded. 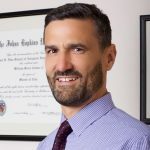 Kolmar Group acquired Greenleaf – The Swiss trading group bought the small Connecticut plant that it had been tolling. REG acquired Sanimax – REG added to its fleet by buying this multi-feedstock Wisconsin plant, REG’s 11th biodiesel plant. High Plains Bioenergy acquired Terra plant – High Plains added a second plant by picking up this non-operating Missouri plant. BIOX acquired Methes plant –Canadian BIOX added this non-operating plant in Sombra, Ontario. BIOX and World Energy acquired Green Earth Fuels – BIOX/World Energy teamed up to buy the non-operating Texas plant. World Energy acquired Elevance plant – World Energy bought the Mississippi plant featuring water access. Agritrade and Solfuels acquired Delta American Fuel – The Singaporean companies teamed to acquire the non-operating Arkansas plant. 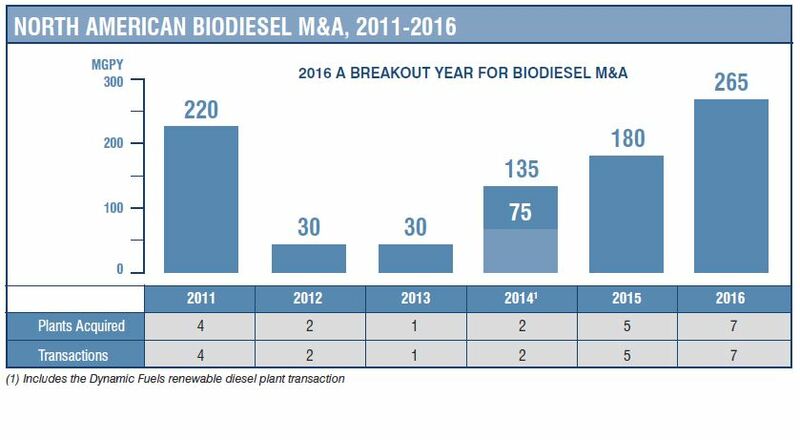 Consolidation was primary driver for biodiesel M&A as well. All deals involved operators or traders expanding their asset bases. The other theme of the year was the increased activity of international buyers of US biodiesel assets, providing evidence, along with the increased biodiesel imports, of a globally-integrated industry. Ocean Park tracked 5 M&A deals in advanced biofuels during 2016. Most of these transactions were part of a wind-down process or occurred in place of a financing event. Like ethanol M&A, Abengoa’s bankruptcy was central to advanced biofuels deal flow in 2016 as Abengoa sold its non-operating, cellulosic ethanol plant to Synata Bio. Tesoro expanded its advanced biofuels capabilities by acquiring Virent’s bio-based fuels/chemicals demo plants and technology. The European company GFBiochemicals acquired the assets of Segetis, a US-based renewable chemical company. The algae company Joule merged with Red Rock Biofuels, a renewable fuels developer. Finally, industrial biotech conglomerate Aemetis struck a deal to acquire Edeniq, a cellulosic ethanol technology company. For an outlook on renewable fuels, all eyes will be on Washington as the Trump administration and the new Congress set a new course for the EPA, RFS2, tax and trade policy, etc. The Blenders Tax Credit (BTC) expired at the end of 2016, so that will be a key factor affecting production economics. The question is whether the uncertain policy environment or possible regulatory headwinds compel non-strategic asset owners to consider exiting their investments. The US ethanol industry is still relatively fragmented, so Ocean Park expects consolidation to continue. There are still 95 stand-alone plants that account for 5.5 billion gallons per year of production (BGPY) or 37% of the 15.1BGPY of domestic production. Margins were fairly robust in 2016, so most owners were content with their assets. The industry also rang up record production. If M&A ramps up in 2017, it will likely be more scattered, since there is not another Abengoa break-up on the horizon although ADM has publicly announced that it is exploring strategic alternatives for its large fleet of dry mill ethanol plants. Biodiesel is still beholden to regulatory support and government incentives. The industry faces the most risk under the new executive and legislative branches. The counterweight to potentially reduced federal support is the robust financial incentives provided by California’s Low Carbon Fuel Standard which has underwritten increased production and local consumption of renewable diesel and biodiesel. Will more international players acquire US biodiesel assets? It was a banner year for biodiesel M&A. It would be unprecedented if 2017 M&A matches 2016 in deal flow. Funding for advanced biofuels, such as cellulosic ethanol, was scarce. Hence, many players were under financial pressure. Another year of low crude prices would make it difficult to validate business models. Similar to 2016, Ocean Park expects advanced biofuels companies that are unable to stretch funding or raise new capital to seek mergers or sales in 2017. Ocean Park Advisors is a boutique investment bank that advises on mergers and acquisitions, financings and restructurings with extensive experience in the renewable fuels, cleantech, food and agribusiness industries. Ocean Park has completed 23 renewable fuels M&A transactions since 2006. Any securities are offered through Ocean Park Securities, LLC, a member of FINRA and SIPC. Ocean Park’s professionals are licensed registered representatives of Ocean Park Securities, LLC. For more information, please visit www.oceanparkadvisors.com.